Athens, Perry, and Hocking counties. Monday Creek flows 27 miles and drains into the Hocking River south of Nelsonville. 23 of 38 affected stream miles meet the pH target of 6.5. Over 85% of the watershed’s land area is forested. There are 3,172 acres of surface mines and 14,797 acres of underground mines within the watershed. Besides severe acid mine drainage, the stream also suffers pollution from erosion and sedimentation. In 1985, the US Department of Agriculture ranked Monday Creek as the third most severely acid mine drainage polluted stream in Ohio. Since 1994, the Monday Creek restoration partnership has worked together to identify water quality problems, conduct field research and site characterization, as well as prioritize and plan on-going restoration activities. MCRP has completed numerous reclamation projects ranging from capping gob piles to installing lime dosers. To reduce acid mine drainage pollution and Non-Point Source pollution in the Monday Creek Watershed in order to attain the highest possible aquatic use designation. To promote the sustainability of communities in the Monday Creek Watershed. 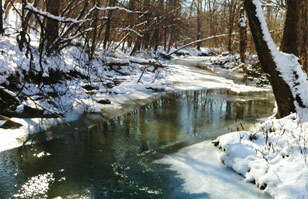 To preserve and enhance a healthy, functioning riparian corridor throughout the Monday Creek Watershed. To increase the species diversity and abundance of fish and other aquatic organisms in the streams of the Monday Creek Watershed by improving stream habitat quality. To encourage and promote sustainable forestry and logging practices in the Monday Creek Watershed. To increase the availability, quality, and quantity of recreational opportunities within the Monday Creek Watershed.